Brigadier General Rufus Smith was the first African American to be appointed a General in the Ohio National Guard. He was also the first black Commander of the 174th Air Defense Artillery Brigade. In 1985, he received a Bachelor of Arts degree in Personnel Management and Industrial Relations from Marietta College in Ohio. He the received a Master of Science degree in Administration in 1998 from Central Michigan University. Smith attended the United States Army War College in 2001, where he received a Master of Science degree in Strategic Studies. Smith’s military career began in 1978 when he enlisted in the United States Army as an active duty soldier. In 1982, however, he transferred into the Ohio Army National Guard. His first assignment was from September 1983 to September 1984 as a Platoon Leader for Battery A, 2nd Battalion of the 174th Air Defense Artillery in Logan, Ohio. Smith rose in rank over the next two decades as he held leadership roles at the platoon, battery, battalion, and brigade levels. Some of these assignments included command of an Air defense Battery, a Forward Support Battalion, a Corps Support Group, and the Air Defense Artillery Brigade. In 2002 he served overseas for the first time as Commander in the 371st Corps Support Group for mobilization of OperationIraqi Freedom. His last assignment came in 2006, where he was named Commander of the 174th Air Defense Artillery Brigade, which was the newest and largest Ohio Brigade. In total, he commanded a Brigade of three Battalions and one squadron. This included the 1st and 2nd Battalions of the 174th Air Defense Artillery Regiment, the 1st Battalion of the 145th Combat Arms Regiment, and the 2nd Squadron of the 107th Calvary Regiment. 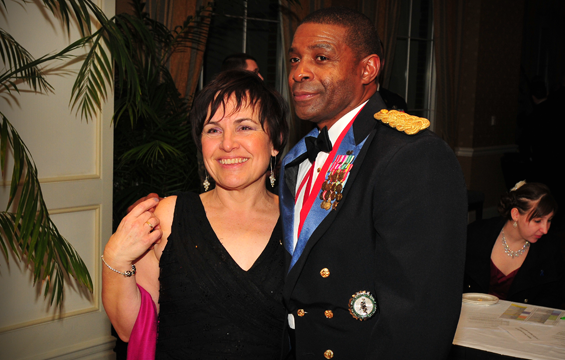 In 2009, he was promoted to Brigadier General, the rank in which he would retire. Smith has received a number of awards. These include the Bronze Star, Meritorious Service Medal (with 2 Bronze Oak Leaf Clusters), Army Commendation Medal (with 1 Bronze Oak Leaf Cluster), Army Achievement Medal (with 1 Bronze Oak Leaf Cluster), Army Good Conduct Medal, Army Reserve Component Achievement Medal (with Silver Oak Leaf Cluster and 1 Bronze Oak Leaf Cluster), National Defense Service Medal (with 1 Bronze Service Star), Armed Forces Service Medal, and Armed Forces Reserve Medal (with Silver Hourglass and M Device). He is decorated with the NCO Professional Developmental Ribbon, Army Service Ribbon, Overseas Service Ribbon, and Combat Action Ribbon. He was also a recipient of the General Douglas MacArthur Leadership Award in 1992. General Smith is a member of the National Guard Association of Ohio and ancient order of Saint Barbara. In 2013, Smith joined the National Center for Medical Readiness in Calamityville, Ohio, as a director. General Rufus Smith and his wife Phillipa, live near Columbus, Ohio. “Brigadier General Rufus J. Smith,” National Guard Bureau, April 2002, http://www.nationalguard.mil/portals/31/Features/ngbgomo/bio/2/2056.html; “Wright State University hires new director for National Center for Medical Readiness” by the Wright State Media Team, Wright State University News Room, Wright State University, September 3, 2013, https://webapp2.wright.edu/web1/newsroom/2013/09/03/wright-state-university-hires-new-director-for-national-center-for-medical-readiness/.